Ready for uncovering the latest ‘Avengers: Infinity War’ Easter Egg in God of War? Yes, the influence of Marvel is everywhere! 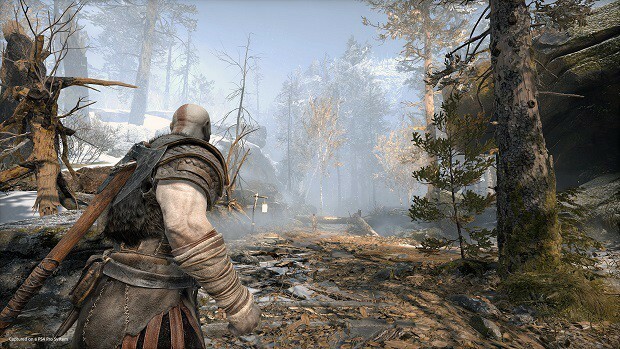 In God of War, this comes in the form of Thanos’ very own Infinity Gauntlet. Follow our God of War Guide closely to equip the Infinity Gauntlet in God of War. Firstly, you will need a bunch of resources and enchantments that go into making that Gauntlet resembling that of Thanos’ one. The Talisman will be very useful against ranged enemies since it fires a projectile that seeks out the enemy. It also deals massive damage in close-quarter combat. It is a must, trust us! Basically, you will need to turn the ‘Shattered Gauntlet of Ages’ and turn into the Infinity Gauntlet. You receive the former during the Favor ‘Family Business’ that you undertake to help out Sindri in Northri Stronghold. Note this Favor will only be acquirable after completing the ‘Fafnir’s Storeroom’ and ‘The Sickness’ quests. After acquiring the Gauntlet of Ages, you will need to upgrade it so it can undergo three Enchantments until it is finally transformed into Infinity Gauntlet. This will require an awful lot in the form of 55k Hacksilver, 2 Dragon Tears, and 18 Dust Realms from Realm Tears. For the second of the two upgrades, you will need 90k Hacksilver, 3 Dragon Tears, and 25 Dust Realms. Happy hunting! For collecting the 5 Dragon Tears in the game, you can first proceed to defeat Hraezlyr in the quest ‘Inside the Mountain’. The next three can be collected during the ‘Free Dragons’ labor which you can read about in detail by heading over to Dragons Guide. Free Otr, Fafnir and Reginn to get the Dragon Tears. After completing the ‘Return to Summit’ mission, you will encounter corpse of Baldur’s Dragon high up in Forgotten Caverns in Midgard region. Climb high to find the last Dragon Tear under the nose of this dead dragon. Once you have collected all the Dragon Tears, you can successfully perform the Enchantments on your Talisman. Similar to Thanos’ six Soul Gems, these six Enchantments will get you a unique ability each. Ivaldi’s Corrupted Mind (Mind Stone) is received after defeating Valkyrie Olrun in Alfheim. Njord’s Temporal Stone (Time Stone) is collected after you’ve eliminated Valkyrie Queen Sigrun at the Council of Valkyries. Muspelheim Eye of Power (Power Stone) can be bought from the shop owned by the Dwarf Bros. in Muspelheim. The Andvari’s Stone (Soul Stone) can be acquired after completing the Brok’s favor in Volunder Mines titled ‘Second Hand Soul’. Asgard’s Shard of Existence (Reality Stone) can be received as a reward after bringing down the Valkyrie Rota in Helheim. Eye of Outer Realm (Space Stone) can be found during the ‘Escape from Helheim’ objective. It will be located inside the Secret Chamber of Odin. Insert any three of these stones into your talisman and get ready for the destruction which the presumed Infinity Gauntlet can bring. This is all we have in our God of War Guide to acquiring Infinity Gauntlet in God of War. If you have any further questions, be sure to let us know in the comments section below!